By shifting our attention away from a mechanical Special Generator of Nikola Tesla to a solid-state version, we shift the whole emphasis from electromagnetism to electrostatics. No longer do we emphasize the need to add more iron to this device's chassis to make it more powerful. Instead, we add more dielectric. And the choice of dielectric material becomes important. Not glass, nor plastic, but a resin derived from living creatures or else delrin. In June of 1976, after the DA fraud case was settled, Gray was able to retrieve what was left of the EMA4-E2 (in boxes) after it had been run through the metal shredder. It is suspected that Hackenburger dug through these fragments and finally figured out what it was that he had over looked. What ever he found lead to yet another disaster just down the road. Some time in 1977 Richard got things to click and the machine came alive in the 50KW region. However, what ever he did was somewhat different that what was done with the EMA4. The result was a huge continuous burst of RF white noise that spanned several radio bands that lasted several minutes while Richard was congratulating himself on being able to figure out what it took to get this machine to come alive. He probably didn’t have a clue that he was generating such a powerful EMI signature, since it was never a problem with the EMA4, then again he didn’t know about the anti-gravity phenomenon that caused Marvin Cole to bolt. In LA during 1976 this kind of event didn’t pass unnoticed by the authorities who are charged with policing the airways. It took them about 2 minutes to get an accurate fix on the source of the disturbance. The very next day two truck loads of armed FBI agents showed up and didn’t even knock. They didn’t even present a warrant. Apparently the War Powers Act of 1941 gives the FCC unmitigated storm trooper authority to do what ever it takes to put an end to any source of unlicensed RF energy. They took everything; the EMA6, the tools, the drawings, the file cabinets, Hack’s soldering gun, and the borrowed coffee pot. Nor were they polite about it. It is unknown just how this issue was resolved. Both men could have been hauled off to prison for life if the FCC wanted to. There probably was a substantial fine involved as well (that didn’t get paid). It probably became clear to the FCC & FBI that these two men were just crackpot inventors and not commie terrorists. The parting message (as recounted by Nelson Schlaft) was straight to the point. “Don’t ever work on this again. WE WILL BE WATCHING”. Some say this event proves that the MIB were involved in suppressing this technology. Actually this is just the run-of-the-mill treatment any tax paying citizen would receive when bucking the establishment in matters of unregulated RF transmission in excess of a few milliwatts. Researchers should keep this in mind. If you are working with this technology and are producing arcs for more than a few seconds, then have a couple of transistor radios close at hand tuned to three separate and widely placed channels (AM, FM, and UHF). Pay attention to how much noise is being picked up and take preventative measures as needed, or else all of your efforts will be hauled off to the local incinerator. You may or may not have to pay a fine and show up in court but you will definitely be told “Don’t ever work on this again. WE WILL BE WATCHING”. 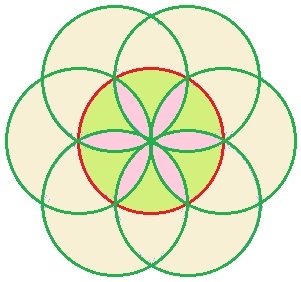 ...and reduce the multiple copper disks to just two: one placed on each side of the aluminum disk. The aluminum disk remains stationary and the copper disks are converted into pancake coils whose diameters are slightly larger than the diameter of the aluminum disk sandwiched between them. The aluminum disk is encased in either a waxy sealant derived from living creatures (the Tesla recipe cited above) or else delrin or something else similar. This sealant becomes the new focal point for the storage of energy. No longer is iron the main attraction anymore, for electrostatics completely dominates this new design - not electromagnetics. Thus, the quote from William Lyne in his book, "Pentagon Aliens", that "for every 200 pounds of iron, one horsepower is added to its output" is no longer the measure by which to judge the augmentation of output. Instead, the mass of dielectric sealant becomes an additional energy sink to serve as the new focal point for this device and further reduce the strategy of how much sealant does it take to improve performance by drastically reducing this standard from "pounds of additional iron" to an unknown fraction of this for sealant - a small enough fraction to make possible the dimensional shrinkage of this device to a mere notebook sized generator as witnessed by my friend who watched as his coworker demonstrated his ability to power a small electric motor with his solid state version of Tesla's Special Generator composed of iron, copper and aluminum as its significant ingredients. To this list we must add an appropriate dielectric when converting Tesla's device from its former glory as a mechanical contrivance to a more efficient solid state model exhibited to my friend by his coworker over a decade ago. The hookups become interesting. The two pancake coils should be connected in parallel with their connection to load, but one of these pancake coils - either one, it doesn't matter - remains disconnected. 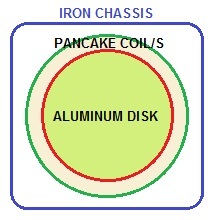 And the rapid spin of the aluminum disk, inherited from the Searl design, is replaced by the use of the dielectric sealant covering this disk and physically separating it from the copper wound pancake coils sandwiching it. The iron chassis remains as a magnetic membrane (derived from patent # 433,702 of 5 Aug 1890) between this generator and its environment which of course includes its load. Thus, the load (for example, a motor) becomes the secondary and this device becomes the primary of Tesla's patented Electrical Transformer, or Induction Device, from Aug 1890. Whether or not it becomes necessary to magnetically couple the chassis of this device to the chassis of the load or to ground, I don't know. This is not a self-starting device. External power has to be provided electrically in parallel to this device and load energizing both, or else the shaft of the inductive load has to be turned to a sufficient RPM, before the external power source can be disconnected. In the mechanical version, external power was continually provided by compressed air so this concern did not materialize.